Karo Tyres Co., Limited is founded by tire industry veterans. Thanks to its strong R&D integration sources, KARO offers the most complete TBR & OTR products line in China. 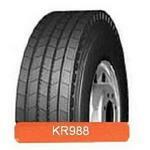 Karo Tyres Co.,Limited attaches the greatest importance to product quality. The best-in-class suppliers can contribute to better quality. With this thought deep in mind, Karo adopt the most advanced Bridgestone and Pirelli, the natural rubber only from Malaysia origin. Karo Tyres Co., Limited wishes to build win-win cooperation with selective top industry players in each territory. Instead of soliciting orders from whoever can place an order, Karo selects the right partners and supports each other to win a better position in the industry. Karo develops different programs for and interacts intensively with its partners to grow together. With the products sold to all the Continents & all the developed countries in the world, Karo Tyres Co., Limited has been proving its commitment and capability with many influential overseas partners.